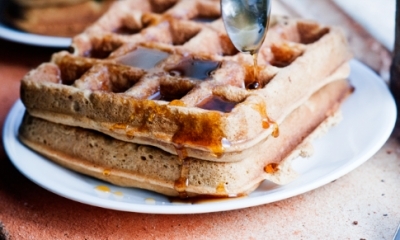 A gluten free, soy free, low in sugar protein waffles made with coconut flour. Low carb. In a large bowl place your coconut flour, protein powder and baking soda. Whisk till combined. Next separate you egg yolks from your egg whites. Place your egg yolks into your dry ingredients along with your coconut oil and buttermilk, and stir. In a separate bowl place your egg whites and whisk for about a minute or so. Then carefully fold in your egg whites into your waffle battle and whisk till combined. By this time your waffle maker should be ready to go. Scoop the waffle batter into the hot waffle maker. Set your waffle maker to whatever setting you like (we did ours in the middle) and let the waffles cook till the maker beeps to let you know they are done. Pop the waffles out of waffle maker onto a plate. Topping ideas: coconut oil, maple syrup, honey, whipped cream, butter or whatever you like on your waffles.